Or did I finish the hood of my CPH with no more than one ball and change. I now can breathe easier that there will be enough to CO. I cannot contain myself… I’m soooo close! I plan on working on the button bands tonight and hopefully finishing them so I can seam on the weekend. I have been following along Cara’s scary nightmare turned deliriously happy ending with my fingers and toes crossed. It’s so easy to knit along on this top and not stop to check if the cables are being turned the right way. I found with my sleeves that I would easily go on to the next row without having turned a cable on one of the sleeves. I’m so happy she found the fix and has shared it with the rest of us cable happy knitwits! Question for my CPHers out there, how did you bind off your hood? I was thinking of doing a 3 needle one from the inside but then just decided to bind off since I had to pick up the stitches anyway for the button bands. An invisible seam should work right? Or do you think I should get this thing inside out and seamed? Random Rant: I came home to my apartment today to find it reeking of paint. I live in a two unit building which is being sold (my lease wasn’t renewed and thus a new home is in the works of being found) and it seems in an effort to spruce the place up to buyers they painted the downstairs studio. The smell from all the painting has infiltrated my apartment (a duplex) which finds me confined to my bedroom on the top floor still getting hints of the noxious paint smell from the ground. Granted I’m quite happy to be lounging in bed tonight as I’m beat tired, but I’m catching whiffs of it and it’s starting to give me a headache. (Sorry for the venting!) It just better not infringe on my peaceful, destressing knitting tonight. I have two school events tomorrow and Wed, plus a huge day on Saturday and then the Superbowl. I have taken Monday off (woo!) to reset the batteries and probably recover from any hangover I predict I will have. 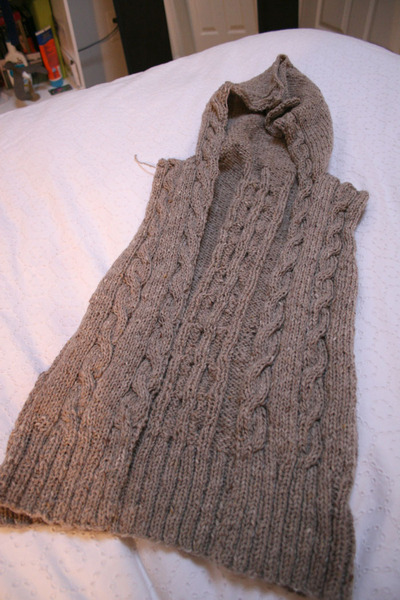 I’m sure before then more and more knitting patterns will catch my eye to drool over and share. Until then, I’m all button bands. I’m such the drama queen! 😉 It’s looking great and I’m so jealous! You’ll be done in NO TIME! Your CPH imminent success is looking good! Feel free to come on over here and finish mine up next, thanks! I have somehow missed the Zephyr train until now, but I’ve been converted, though I am scheming over Wicked. I never was one to pass up a good kangaroo pouch! You are close! Can’t wait to see! Say yes to Glee 🙂 I just cast on! I kitchenered the top of the hood, with good results. 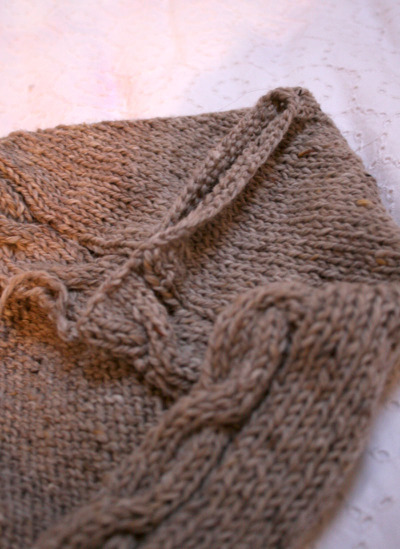 I didn’t bind off the stiches — but you could graft them once they’re bound off, so it’s nearly invisible. If you do it BEFORE you pick up the button band stitches, you can knit it all in one go, if you want. What a nice, wearable color! that was fast! the hood looks great! Sounds like everyone is kind of doing their own thing with the hood BO…..Glee is a great pattern – I keep eyeing it, but I have SO many in the queue right now! It looks wonderful so far! I can’t wait to see the end result.